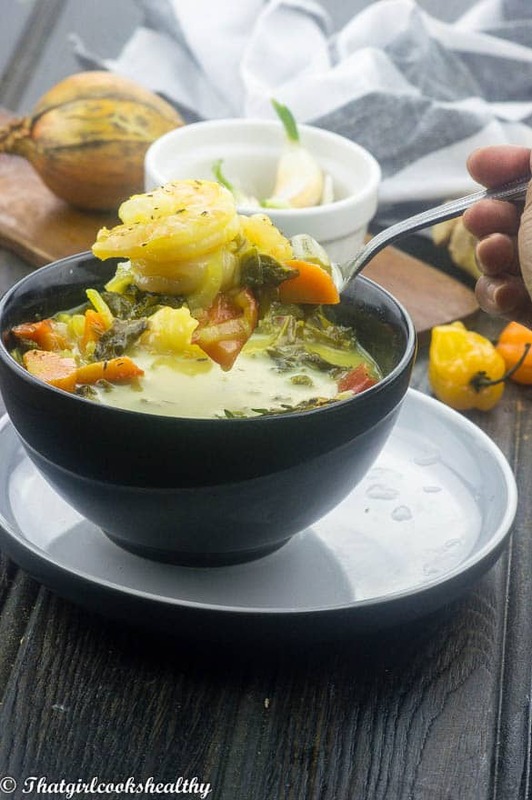 Coconut shrimp soup recipe – Indulge in the warmth and deliciously irresistible flavour of this creamy coconut shrimp soup with a medley of nutritious vegetables. Finally a coconut shrimp recipe to add to the blog. Yes it’s that time of year again, where all the comfort food is on rotation especially if you’re a food blogger, you probably have at least one bad boy soup recipe in your arsenal which you’ll probably share with your lovely readers before winter comes to an end. 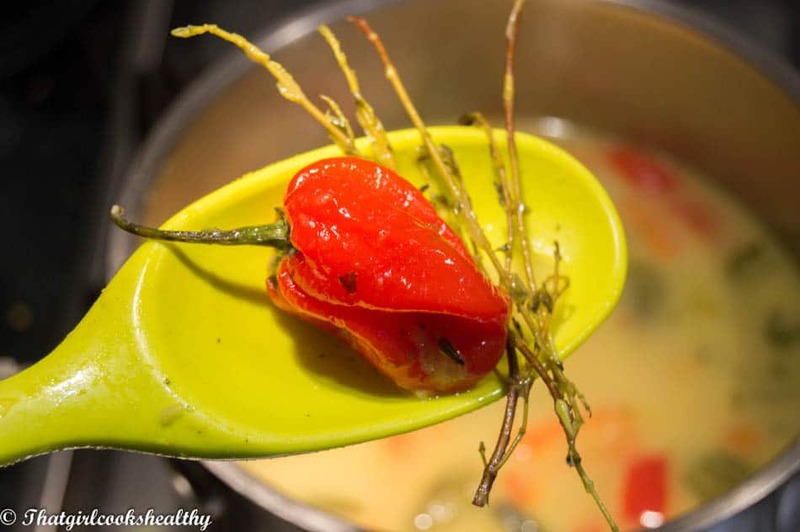 I wanted to share a soup recipe with a twist, this isn’t a Caribbean soup recipe at all. 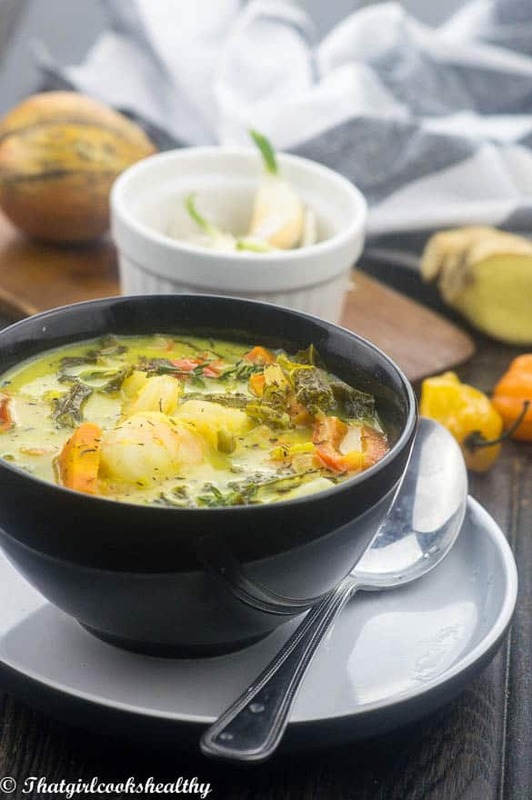 Rather I’ve borrowed a few common ingredients that you will find in island cuisines – thyme, scotch bonnet, okra, coconut milk and lime. 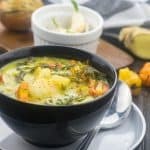 I would summarise this as fusion food, where the tropics meets the far east and you know what this coconut shrimp soup totally rocks! I never in a million would have thought of adding shrimp to soup, I underestimated the idea. I’m so used to preparing soup with a whole, chopped up or a fillet of fish, that’s how I was taught to do it. I feel as if this recipe has made me step outside of my comfort zone in a very positive way. I love this soup so much that I went back for seconds before the rest of the crew quickly drank it all. All of the ingredients are very easy to obtain excluding the scotch bonnet, if you’re not from a region where there is an African/Caribbean community this may present a problem. However, scotch bonnet is only used for it’s warming flavour not heat, so it isn’t a crucial ingredient. You can substitute with a whole chilli instead. 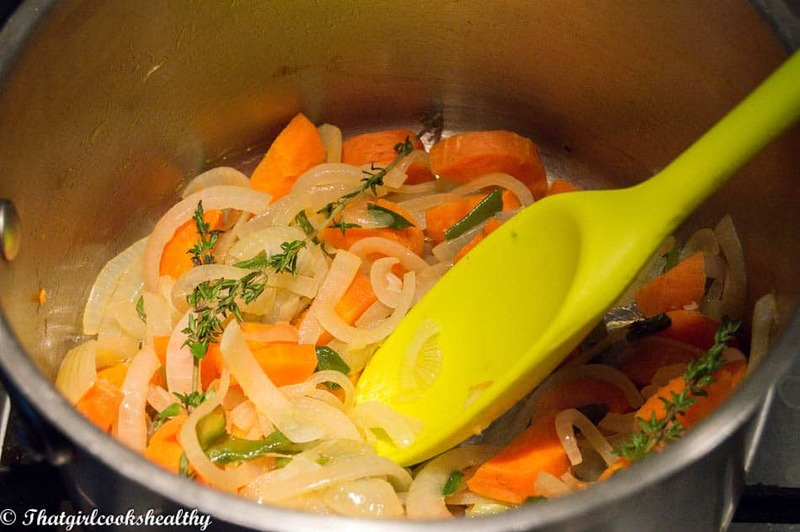 For coconut shrimp soup you will need…………. a large stock pot to prep the soup. I sauteed the garlic, onions, scallion, carrots, okra, kale, red bell pepper than added the ginger and thyme. 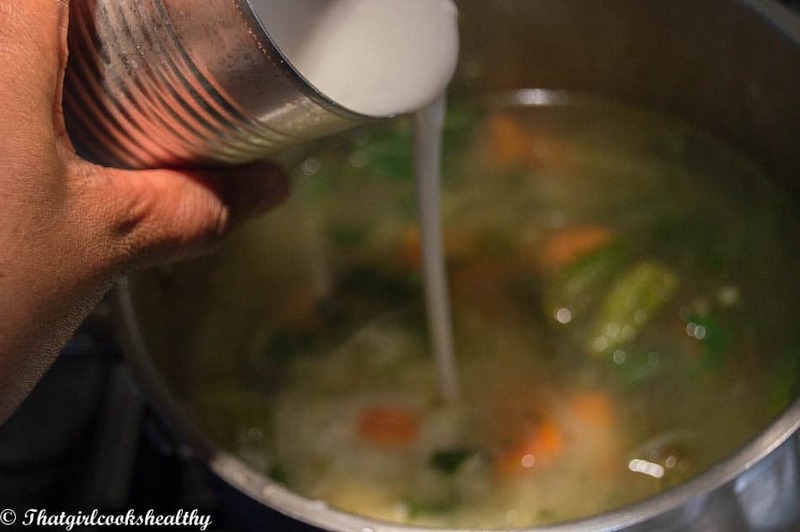 When adding the liquid, add both the vegetable stock and coconut milk at the same time. If you want your soup to have thickness. I suggest mixing a tablespoon of tapioca starch with 2 tablespoons of warm water. Then stir it in with the stock and coconut milk. Don’t forget to remove and discard the stem of thyme and scotch bonnet/chilli. Add the raw shrimp (the lighting makes them look slightly pink) last amount 5 minutes before cooking completion. 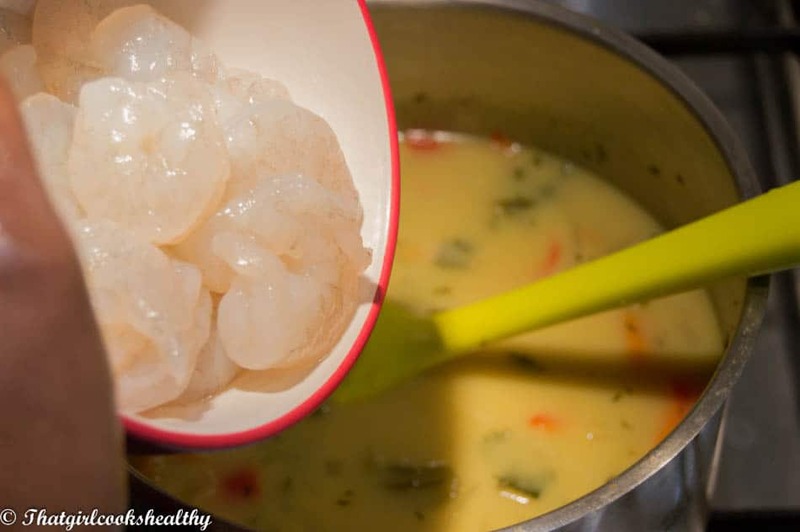 Try not to reheat the soup with shrimp as they will become rubber in texture. What I do is either add then eat immediately afterwards or cook the soup and only add the amount of need nearer to consumption. And there you have the finished results…….yum! Looking for other soup options? Melt 2 tbsp of coconut oil in a large stock pot on medium heat. Proceed to add the onions, scallions, thyme. carrots, garlic, bell peppers, kale, ginger and okra then sautee until the vegetables are slightly soft and fragrant. This should take approx 5 minutes make sure to stir to prevent the onions and garlic from sticking/burning. Pour the vegetable stock and coconut milk into the pot and stir in the tapioca mix if you want a thicker soup base. Bring the creamy soup to a rolling boil then season with parsley, black pepper, salt, chilli flakes and stir. Add the scotch bonnet (DO NOT BURST OR PRICK) then reduce the heat to low with the lid on. Simmer for 20 minutes until the soup thickens. Discard the thyme stems and scotch bonnet before finally adding shrimp. This looks delicious! I’m all about that shrimp but never put it in soup! Thanks Carmy, me neither first time and it was a hit! 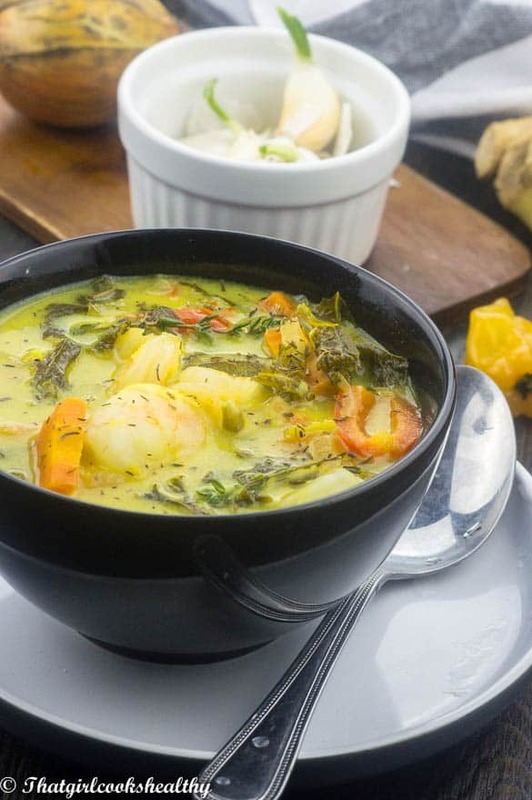 I adore coconut with shrimp — and especially in a soup! The broth looks so luscious! definitely a delicious marriage between the tropics and the far east! YUM! Thank you! Fusion food rocks! This reminds me of a soup I used to get in Chicago. Love that its dairy free but not lacking in flavor. Thank you! I always try to balance the flavour accordingly. This looks so yummy and pretty. Perfect for these cold days and would make such a hearty n healthy meal anytime.